A Japanese feat involving 3 Olympic fencers against 50 ‘noobs’ went viral – and quite rightly so! 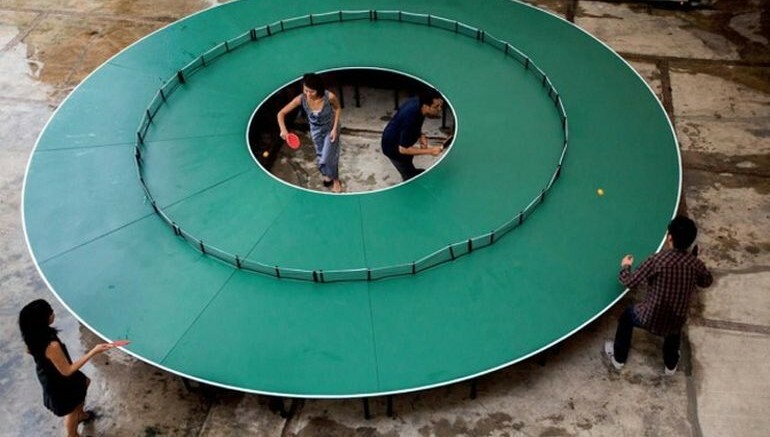 Well, this time around, the same levels of glorious achievement can be showcased by ping-pong experts, courtesy of the donut-shaped Ping Pong Table designed by Singaporean artist Lee Wen. As one can comprehend from the above image, the aptly named ‘Ping-Pong Go Round’ allows the experts to jump right in the middle, while they fight off ‘hordes’ of other players coming from an open 360 degree angle. 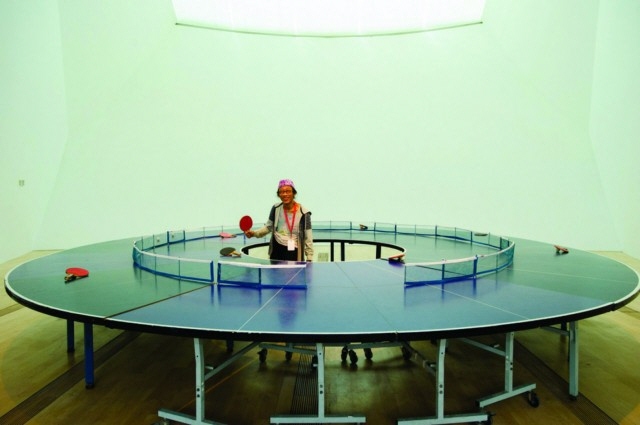 Interestingly, the first ‘prototype’ of the Ping-Pong Go Round was designed way back in 1998, as a component of an interactive art installation exhibited in Australia. Of course, the design was not contrived for our mind-conceived scenario – that entails pitting experts against the amateurs. Rather, it was created to allude to “a different perception of the limitations” encountered by the players when using the table. 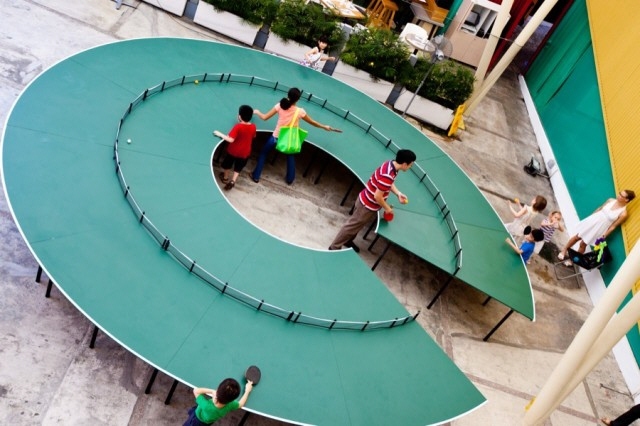 In other words, the round table goes beyond the linear-setup of a regular Ping Pong Table, to account for a broader level of interaction (between people) from literally all sides. At first I was not too happy to present the smaller one as it was scaled down. 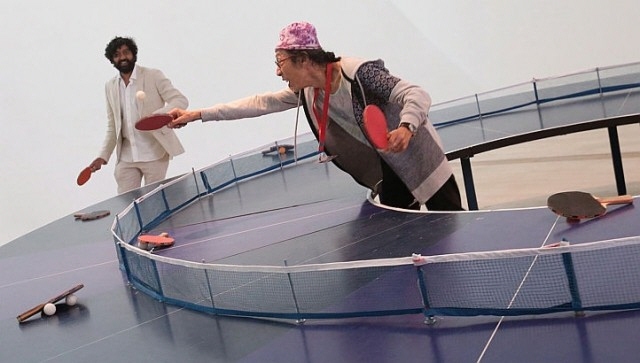 But as it turns out the smaller table had its advantages, as [one viewer] observed the smaller one is more intimate where players have to hit the ball with more care, just like a more considered speech at the international meetings or conferences of globalization and diverse societies and countries of multi-culturalism. 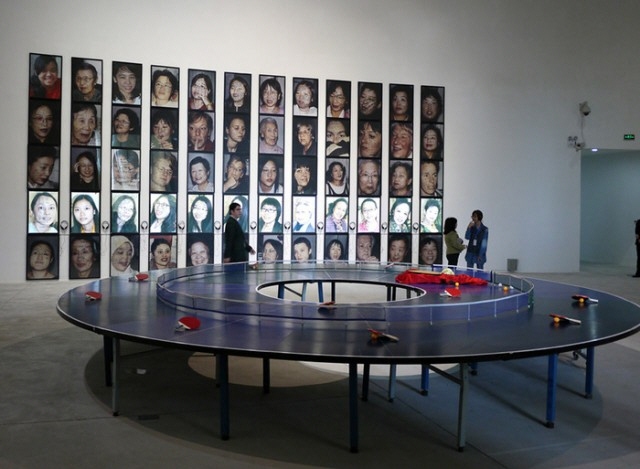 The Ping Pong Table once again made its appearance in 2014, at Art Basel Hong Kong. But unfortunately for now, we do not yet know of any plan for the Ping-Pong Go Round to makes its commercial debut in the near future.